Bernau bei Berlin (English Bernau near Berlin) is a German city in the Barnim district. 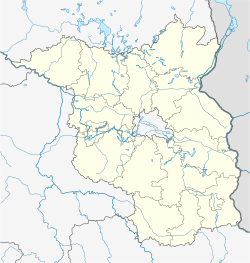 The city is located about 10 km (6.2 mi) northeast of Berlin. In 1842 a railway line was opened. One of the first electrical suburban railway lines in the world has been opened in 1924. This line of the Berlin S-Bahn connected Bernau with station Stettiner Bahnhof (today Berlin Nordbahnhof) in Berlin. The Allgemeiner Deutscher Gewerkschaftsbund (ADGB) (General German Confederation of Trade Unions) opened its school in 1930. The Waldsiedlung (engl. residential area in the wood) is a district of the city where the political leaders of the GDR lived isolated from the people. ↑ "Bevölkerungsentwicklung und Flächen der kreisfreien Städte Landkreise und Gemeinden im Land Brandenburg - 2017". Statistical office Berlin-Brandenburg. Retrieved 10 March 2019.